Motorola, now a Google company, and their USA-assembled phone has been in the news lately, as well as Apple and their tentative plans to assemble select products in the USA. Perhaps seeing parallels between the smartphone industry and the increasing outsourcing of tool production in recent years, a ToolGuyd reader wrote in with a comment about the new assembled-in-the-USA Moto-X. Google is making their new phone in Texas I hear. Something like $4 more per phone. Think the tide is turning ? Clarification: Motorola is simply “assembling” the new Moto-X phones in Texas. I am actually faced with having to upgrade my mobile device this month, and opted for a made-in-China Motorola phone that better suits my needs. It’s nice that Google and Motorola are assembling the Moto-X phones in the USA, but it seems to be more of a marketing stunt than genuine gesture or prompt for change. That the phones will be assembled in the USA means that Motorola can offer customization options (housing colors, opening screen personalization, etc). My feeling is that this was a more significant factor in their decision than anything else. Apple has been hyping up their own “assembled in the USA” plans, and from what I remember hearing, machining of their upcoming professional desktop workstation chassis might be done in the USA as well. But for the time being, there won’t be any tangible differences between a phone assembled in the USA and a phone assembled overseas. I would consider it a step in the right direction, but I find myself too skeptical of these companies’ motives. The unfortunate fact of the matter is that the US does not have the manufacturing ability to build the components these smartphones are built with. I’m crossing my fingers that this pattern continues, but the unfortunate truth is that companies like Motorola and Apple seem to care little about bringing jobs back to the US workforce. The free publicity Motorola has received has more than justified the $4 or so increase in assembly costs per phone, and that’s what the top executives are more often happy to see. The total production cost is said to be $225, of which $4 is a very minor amount. 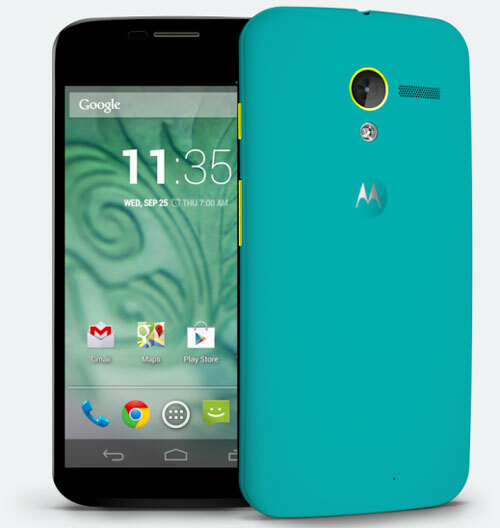 Motorola’s marketing budget for the Moto-X has been said to top $500 million. It has been reported that Samsung has sold 20 million Galaxy S4 units in the two months after it launched, and that’s globally. I can’t find an exact number of how many iPhone 5’s Apple sold, but one source estimates sales to be at about 56 million units. If Motorola sells 10 million of these USA-built phones, which seems like a reasonable projection, then the total $4/phone added production cost will be 8% as much as their overall marketing and advertising budget for the phone. My point is that assembling the phone in the USA is likely done just for marketing. It was also done to allow for users to “design their own phone” with their choice of colored back panel, bezel, and personalized startup splash screen, but that added to the Moto-X’s ooh-lala appeal. I very much want to see a renewal of USA manufacturing, but I’m afraid that the USA-assembly of the Moto-X is not a sign of change. It’s a sign of clever marketing, both in terms of free publicity and Motorola’s “design yours” and “make it yours” motomaker feature that USA assembly was structured to allow for. Stuart, I agree with you. Personally I rather have a phone that was 100% American made, but I don’t think I will ever see those days again, but to be honest, assembled in USA is a nice step, but it’s marketing and I doubt your average consumer who even buys electronics, such as phones even cares about the country of origin of their phones. In my opinion, given that most electronics are made overseas, namely China, I would love to see more companies bring back the manufacturing to America. However, I foresee Google doing this more than Apple, at for now. Apple hasn’t made any American made products in a long, long time, yet Google has, albeit not to the extent Apple has. If I ever needed a new phone, if my options are slim, I rather have a assembled in America phone with some American made parts than just a made overseas phone. At least I’ll be able to support American manufacturing, even if it’s a marginal degree. I would gladly pay more for a American made phone, as chances this would last me multiple years. I may prefer working on Apple computers (since 1980’s); but I trust that company to operate as devils where commerce is concerned. in about three years. I presume that the scant sales of Mac Pros occur, predominantly, in the USA. My Mac Pro weighs more than anyones’ UZI. Even in it’s smaller incarnation, I’m sure it will be hefty. Perhaps that cost has already reached equilibrium? Three-five years = usual period of “tax incentives” offered by local governments. Icing on the cake = your previously mentioned marketing hype. Lastly, and least; since I’m perusing tool guyd, you can accurately guess that I’m a person who has paid attention to manufacturing quality. The Mac Pro of the past…decade?…has traditionally been constructed out of a good amount of aluminum….. china….manufacturing….metal…..negative stereotype…. since Google sold Motorola to Lenovo, the days of these phones being made stateside may be numbered. I just bought a Moto X. I hope I still get the updates as quickly as the Nexus phones.